BELIZE CITY, Wed. Dec. 7, 2016–In a press release issued on Tuesday, December 6, the Government of Belize invited holders of its 2038 bonds to weigh in, on new proposed terms “in order to put the Bonds on a sustainable footing.” The release came as an official delegation headed by Prime Minister Dean Barrow was in New York, trying to advance negotiations to ease debt payments due to spike in 2017, as the Government tries to stave off a possible default on next February’s payment of US$13.5 million. “Obviously, the acceptability of any particular approach to holders will depend on the precise financial terms of the amendments. That said, the views of holders on the structure of the amendments would be useful at this stage,” the Government said in a release published on the website of the Central Bank of Belize. Also published on the website is a PowerPoint presentation on what the Government of Belize describes as “an imperiled economy.” Whereas much of the talk has been about the current state of affairs—an economy in recession, a fall of over $100 million in export earnings, shrinking international reserves, and a growing debt burden—the gloomy forecast warns of a catastrophe by 2022. However, the Government tells bondholders that its overall objective is to restore Belize’s economy to a path of sustained growth. “To this end, the Government is seeking Parliamentary approval for a rigorous fiscal reform agenda. These fiscal adjustment measures, however, will need to be complemented by significant debt relief,” the press release added. This is the third time that the Government of Belize is seeking to have the terms of the super bond debt renegotiated and bondholders have said that the last round saved the country US$100 million. “No one – least of all the Government of Belize – wishes to contemplate the prospect of a fourth restructuring of these instruments,” the Government said. Belize’s debt burden totals $2.8 billion, but it is forecast to reach $4.4 billion in the next six years. Meanwhile, debt payments are forecast to increase from $264 million a year today to $747 in 2022—a three-fold increase, with a substantial chunk of the debt being domestic debt acquired to settle compensation for the former owners of Belize Telemedia Limited (BTL). For their part, bondholders have not signaled whether they will agree to modify the terms of the existing debt agreement. The super bond, valued at BZ$1.053 billion, according to the Government’s document, accounts for 80% of Belize’s external debt. Even as debt mounts, the economy continues to shrink. The Statistical Institute of Belize (SIB) recently announced that the Belize economy has contracted for the third consecutive quarter, contrary to the forecasts prepared in 2012, when the last round of super bond renegotiations began. 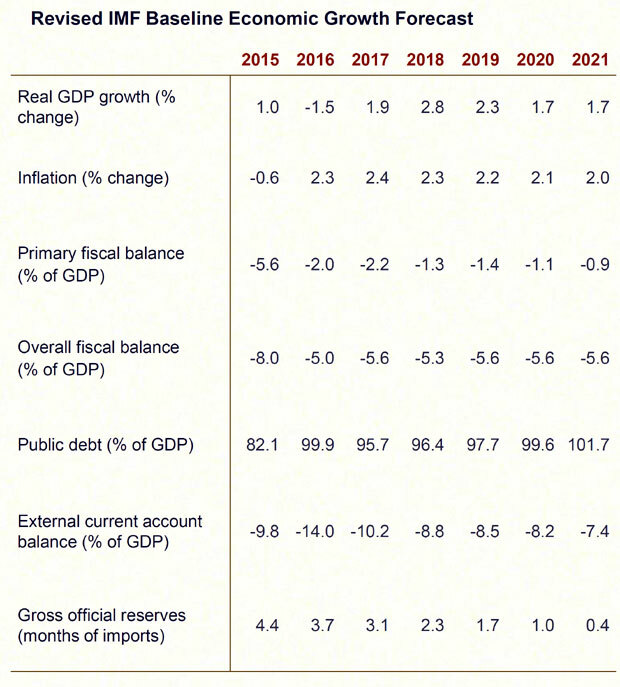 Forecasts by the International Monetary Fund (IMF) “have been progressively downgraded since September 2015, with GDP growth forecast for 2016 falling from 3.5% in September 2015 to -1.5% in September 2016,” GOB’s economic summary said. The Government also provided more details on the ongoing economic recession, following from an economic slowdown which it said began two years ago: “Overall growth fell from a robust pace of 4.1% in 2014 to 1.0% in 2015,” said the report, pointing to a new projection that Belize’s economy will contract, with GDP growth of -1.5% for 2016. Back in July, the alarm was sounded by former Central Bank Governor, Glenford Ysaguirre, that the payment of US dollar to the Michael Ashcroft enterprises, which formerly held shares in Belize Telemedia Limited, which the Government nationalized in 2009, would lead to dire economic repercussions—among them being a foreign currency crunch which could trigger problems on the finance and trade front. On the current trajectory, Belize’s foreign reserves will continue to shrink and possibly dry up in about 6 years, based on the Government’s economic report. 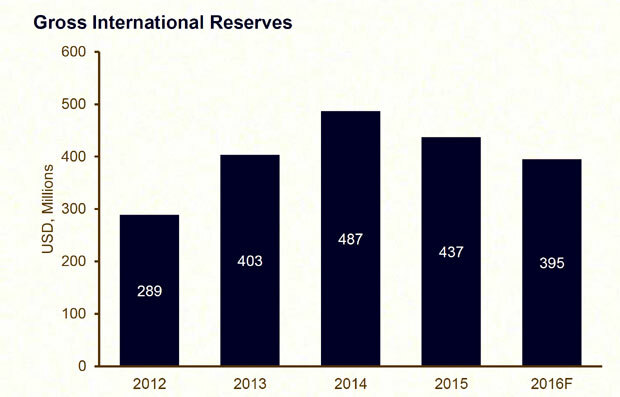 At the same time, oil production is forecast to cease with the depletion of reserves at fields currently under production. The matter has been worsened by the loss of correspondent banking due to de-risking by foreign banks, which has not just affected Belize’s commercial banks, but also the Central Bank of Belize. 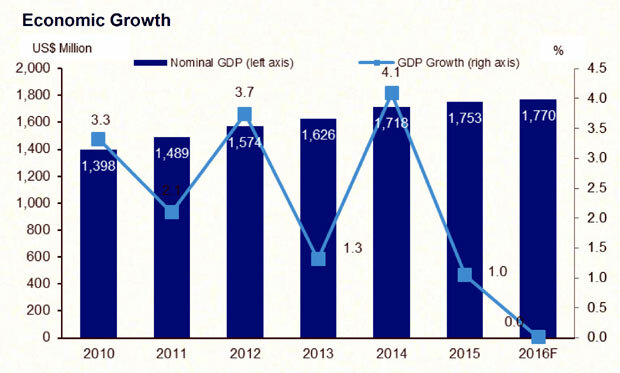 According to the Government’s presentation for bondholders, “Belize is facing a prolonged period of slow growth,” and economic growth is forecast at 1.6% for the period 2016-2021, below the average of the past five years. “The outlook for Belize’s economic growth is not promising. Headwinds remain strong, and will require concerted action by the government to put the economy back on track,” it added. There are still mounting multi-million-dollar problems ahead: the outstanding payment of US$100 million for BTL will become due next year even as the government battles other foreign arbitration awards, including awards for other Ashcroft companies, which total more than US$100 million. The Government has yet to unveil the gamut of “fiscal reform measures” it plans to undertake in the next budget year. Some suspect that this could include a hike in the general sales tax levy; although the Government has promised to consult before any such decision is concretized. There are also key non-fiscal reforms which have been outlined, and primary among them is the need to take action to improve the performance of Belize’s primary export sectors, as well as making it easier to do business in Belize.